As I try to recuperate and unpack from Norwescon, I will take a quick break to write up a review. As usual, it all went by much too quickly. The main goal for the weekend was to promote Steamcon III, so the Steamcon lobby table was our main focus. A scant couple of weeks before the con, I came up with a crazy idea to draw more folks to the table, the Golden Egg-stravaganza! 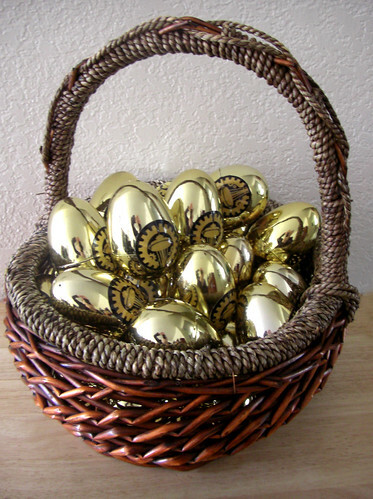 Essentially a bunch of candy, badge ribbons and mystery prizes in gold colored eggs. Each egg was a one dollar donation. I didn’t have much time to find the prizes, but I used some Steamcon stickers, buttons and such as well as a few little compasses, dirigibles, hot air balloons and little octopi. We also gave away four full Steamcon III memberships, which really delighted their recipients. The eggs were very popular. Too popular! I realized that we would sell out completely on Friday morning, so I put half of them aside for Saturday. We still sold out before noon each day. Live and learn. I am already plotting for next year. As another ploy to draw attention to Steamcon III, I dressed in somewhat 20,000 Leagues regalia. My Saturday outfit was Nemo’s daughter as an admiral with a little bit of the sea in her blood as it were. It was quite well received. I participated in the Under the Sea fashion show, which was very creative. On Saturday night, I did a second version of Widget the automaton. The lightning goggles and makeup were a huge hit. I had about five panels, almost all on steampunk or related themes. Despite having done this for so long, I am always learning more about steampunk. I want to say thanks to Lou Anders of Pyr for some great insights and stating that Sherlock Holmes is not steampunk. One of my favorite people, Claire Hummel was on many of my panels as well and she is always a fount of new information and good insights. Social anthropologist, James Carrott followed me around to my panels to record the discourse in preparation for a dinner at the Dahlia Lounge on Sunday hosted by Brian David Johnson, the futurist at Intel. Brian’s goal was to gather steampunk “luminaries” to discuss steampunk with an eye toward what we could add to future technology. The dinner was lovely and the discussions quite lively. The Foglios, Paul Guinan, Anina Bennett, Kevin Steil, Claire Hummel, Thomas Becker, Jordan Bodewell, Marshal Hunter, R. “Martin” Armstrong and myself along with James and Brian discussed steampunk past, present and future while the cameras rolled. I confess to being quite intrigued by what may come of this. If nothing else, hanging out with James and Brian during the convention, was very entertaining and thought provoking. Thanks to both of you! It was a marvelous but exhausting weekend. You can see the photos my darling husband took on Flickr.com.